…A wholehearted commitment to truth, honesty and a new life. …A wholehearted commitment to abstinence. …A wholehearted commitment to recovery. Everyone on the Buddhist path is in recovery from greed, hatred and delusion; for some of us that manifests as particular cravings and aversions accompanied by an awful lot of confusion! The 5th Precept Sangha (Fellowship) is a Peer Led, mutual-help organisation that uses Buddhist teachings, traditions and practices to help people make a wholehearted new life after the suffering caused by addictive behaviours. The group is founded on the principles and practices of Truth and Truthfulness (Sajja), Generosity (Dana), Harmlessness (Sila), Loving-kindness (Metta), Forgiveness (Khama), Mindfulness (Sati) and Fellowship (Kalyāna-mittatā); and is grounded in the Buddhist principles of non-harming, compassion and interdependence. To refrain from harming ourselves or others by our thoughts, our words or our actions. To refrain from false speech, harsh speech, gossip and slander. To refrain from taking alcohol and other drugs that lead to suffering. Sit and Share meetings are open to people with any addiction and to any individuals choosing to live life in harmony – as best we can – with the Five Precepts. Importantly, we abandon attachment to negative self-views by announcing ourselves by our first name only, without identifying with any addiction. The 5th Precept group promotes a multilayered, multidirectional Buddhist-oriented approach to recovery and abstinence : Foundations of Recovery. It is important to note that you do not have to be a “Buddhist” to practice Sajja, Sila or any of the suggested meditation practices. Group membership does not require any meditation experience. Nalagiri House : is a retreat centre in Tipperary, Ireland due to open late 2018. 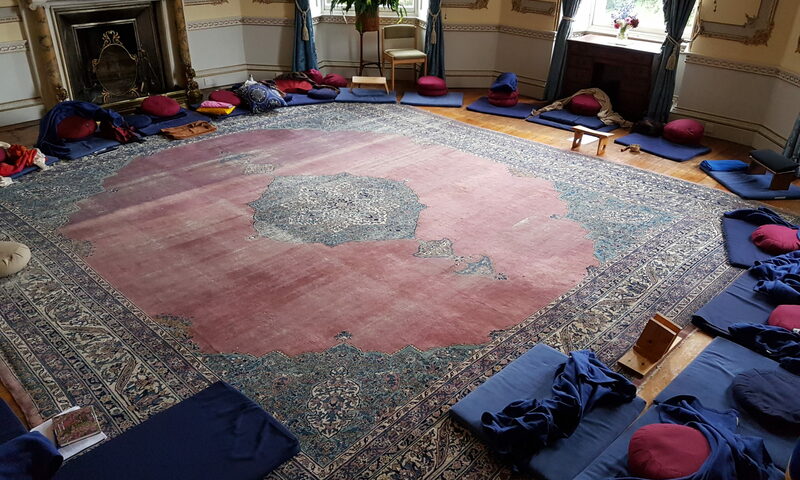 In the main, most weeks, there will be 6-night ‘Everyday Mindfulness‘ retreats which will be experiential explorations of ‘Sati‘ or ‘Mindfulness in a Buddhist context‘. These weeks will be very relaxed with 3 x 40-minute meditations throughout the day, a mindful work period in the morning, free time in the afternoons, and an evening group ‘Sit-and-Share’ meeting. These retreats will not be entirely silent but there will be periods of silence and one complete day of silence each week. Occasionally, Nalagiri House will offer ‘Hungry Ghost’ retreats which will be much more experiential, interactive and instructive. Individuals looking for help with stress, burnout, anxiety, depression, trauma, or addiction have found these retreats very helpful in the past.